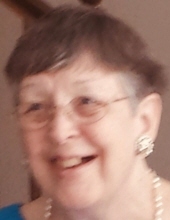 Patricia ‘Pat’ Ann Janke (nee: Malloy), 84 of Lorain, Ohio, formerly of Sheffield Lake, Ohio died Saturday morning, November 3, 2018 in the University Hospital, Elyria Medical Center. She was born in Strongsville, Ohio on February 8, 1934 to the late Rose Mary (nee: Pekarek) and Francis ‘Frank’ Joseph Malloy, Sr. Mrs. Janke was a 1952 graduate of Lorain St. Mary’s High School. She was employed for forty three years for Rite Aid Pharmacy, formerly Cunningham Drug Store in the Shoreway Shopping Center, Sheffield Lake. Mrs. Janke managed the Tenneyson Lawn Apartments, Sheffield Lake for twenty years. She attended St. Thomas The Apostle Church, Sheffield Lake. Mrs. Janke is survived by her son, Eric M. (Lynn) Janke, her daughter, Adrienne L. Janke, sisters, Ellen D. Meckley and Rose M. Malloy and numerous nieces, nephews and cousins. In addition to her parents, she was preceded in death by her husband, Norman James Janke in November of 1998, her brothers, Francis J. Malloy, Jr., William C. ‘Bill’ Malloy and Daniel P. ‘Dan’ Malloy and her sister, Catherine A. Seskar. The family will receive friends on Wednesday, November 7, 2018 from 3:30 PM until 6:30 PM. in the Walter A. Frey Funeral Home, 700 West Erie Avenue, Lorain, Ohio 44052. Funeral services will follow at 6:30 PM in the funeral home. Burial of cremains will be at a later date in Resthaven Memory Gardens, Avon, Ohio. Online condolences may be sent to www.freyfuneralhome.com. Memorial contributions may be made to the charity of your choice in Pat’s memory. To send flowers or a remembrance gift to the family of Patricia Ann Janke, please visit our Tribute Store. Burial of cremains will be at a later date in Resthaven Memory Gardens, Avon, Ohio. "Email Address" would like to share the life celebration of Patricia Ann Janke. Click on the "link" to go to share a favorite memory or leave a condolence message for the family.